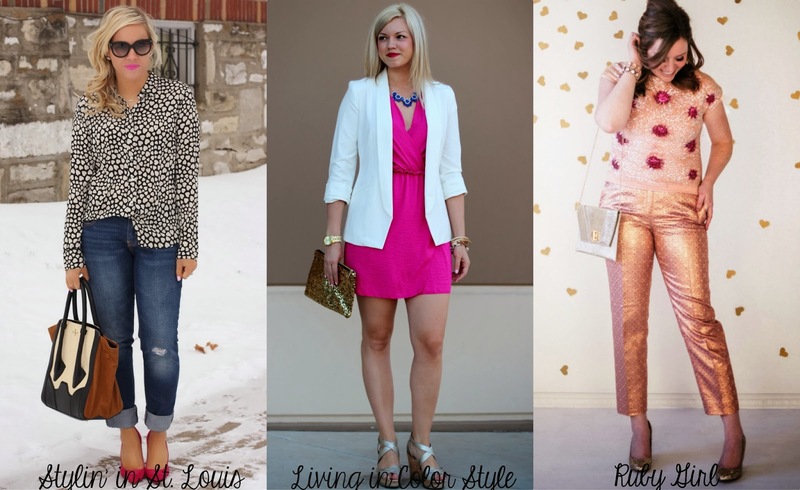 Stylin in St. Louis: Spotlight Weekly: Red, Pink, and White…. Spotlight Weekly: Red, Pink, and White…. Happy Thursday! Tomorrow is Valentine's Day! So crazy! I decided to go for a more relaxed look for this Red, Pink and White theme! I paired my jeans with a simple heart shirt. Such an easy combo and the little pops of pink make it a little bit more festive! Come share your red, white, and pink looks with Elle and I! 1. We kindly ask that you follow the two hosts: Elle from Living in Color Style and Jacqueline from Stylin' In St. Louis via Bloglovin or GFC, and of course, our co-host, Lindsey from Ruby Girl. Spotlight: Our spotlight this week is Ellen from Everyday Fancy! Her floral top is just perfect with her striped shirt! She is so clever with her look! That crop top is perfect layered! Be sure to check out her blog! Nextweek: Next week our spotlight weekly theme is Pastels! Thanks for linking up! See you next week! I can't believe those jeans are Old Navy! I love them! This is the perfect mix of casual & glam! I know! In store, I paid $10 dollars for them! Love your laid back pink look! Pink is great in small doses also! And I always drool over that bag of yours! Thanks for hosting! Thank you Carylee! You are so sweet! I love this bag! Love this look!! Just discovered your blog via the link up and I'm so glad that I did! You have amazing style! Great laid back Valentine's Day look. Love the pop of pink lipstick! LOVE that top! Perfect valentines day look with the pops of red and pink. Perfect top for Valentines and I am in love with your heels. Love this outfit. You look beautiful! love this outfit - the bright heels add the perfect pop of color! you look beautiful. I love this post! Theres a lot of inspiration here. Pop of color, printed, bold and the list goes on! I have always loved that J.Crew top! Such a great pattern! Your outfit is really adorable! I love the pop of color from the heels! Love the casual look with a pop of red! You look gorgeous as always! One of my favorite blouses! Great minds think alike! You look gorgeous! Pink pumps have got to be one of my FAVORITE outfit accents! This is an adorable outfit head to toe. Thank you! Pink pumps are the best! The heart print is just darling on you! The fact that your lipstick matches your shoes is amazing! P.S. I used one of your posts this week to inspire my outfit! You can see it here.